The note took no prisoners. 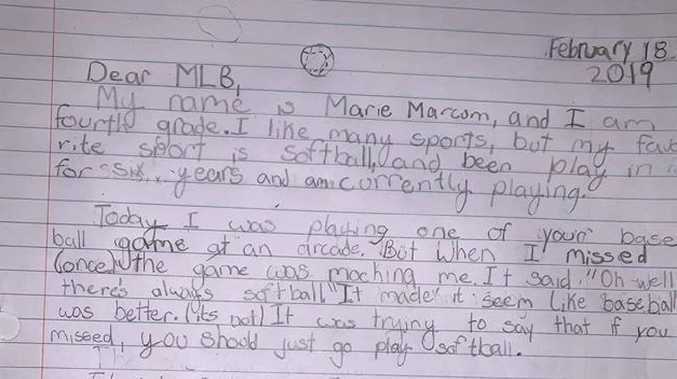 A NINE-year-old softball player from America has written the perfect response to Major League Baseball (MLB) after she felt disrespected by a cold snub. Playing a baseball arcade game at a Chuck E Cheese entertainment centre and restaurant, Marie Marcum was showing off her throwing arm but what was supposed to be a fun activity took a sour turn when the game didn't appreciate her efforts. "Hey, there's always softball," the machine said after one wayward throw. Marie was infuriated by the suggestion softball was somehow of lesser importance than baseball and for less qualified players. Speaking to ESPN, Marie said: "I was really mad. It made me feel like they think softball is a bad sport and girls shouldn't play softball. I just started throwing balls at the game as hard as I could. I thought it was rude." 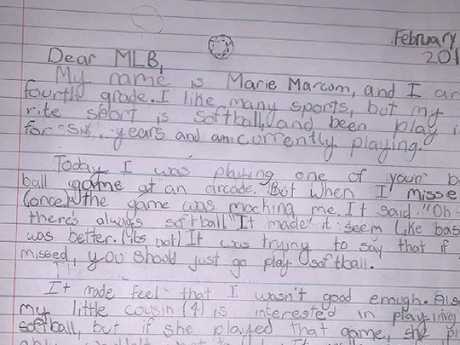 After talking her anger through with her mum, Marie decided to write a letter to the MLB, who is reportedly responsible for selling the game - and the youngster didn't hold back. "Dear, MLB," she started. "I like many sports, but my favourite sport is softball (which) I have been playing for six years. "Today I was playing one of your baseball games at an arcade. But when I missed (once) the game was mocking me. It said, 'Oh well, there's always softball'. "It made it seem like baseball was better (it's not). It was trying to say that if you missed, you should just go play softball. "It made me feel that I wasn't good enough. Also, my little cousin (4) is interested in playing softball, but if she played that game she probably wouldn't want to play. It made me feel angry. "I hope that you could fix it somehow. One way to fix it is by changing what it says when you miss a throw. Example: 'There's always next time' or 'try again'. I took a picture of the game so you know which one. "I hope you can make some changes please." Marie's mother helped her with the letter and was one proud parent as her daughter decided to stand up for what she believes is right. "I'm trying to raise a kid who's independent and proud to be a girl and eventually proud to be woman. She loves softball and is proud that she plays," Lisa Marcum wrote on Facebook. "She turned around after hearing that and looked so sad/mad. She started angrily throwing the balls at the game. I had not heard it at this point but I saw she was upset. When I grabbed her arm and told her to settle down that's when I heard it. She looked at me and said, 'Did you hear that?! I want to talk to someone who works here. I don't like that this game says stuff like that'. "The employee told us the company that sells them the game. We left and she was telling me the whole way home how upset she was. She brought up how other kids, especially younger girls, would probably also be upset, or that it may make them not want to play softball because it is made fun of. Then I saw that the MLB sponsored this game. Totally disappointing. "It's hard enough to be a female but it's really sad that these messages start in places like this. She should have been having fun earning tickets by throwing the ball around (which she loves), but instead she is questioning why the sport she enjoys is used to tease people. I'm hoping the game gets removed or at least the sounds and taunts are changed."